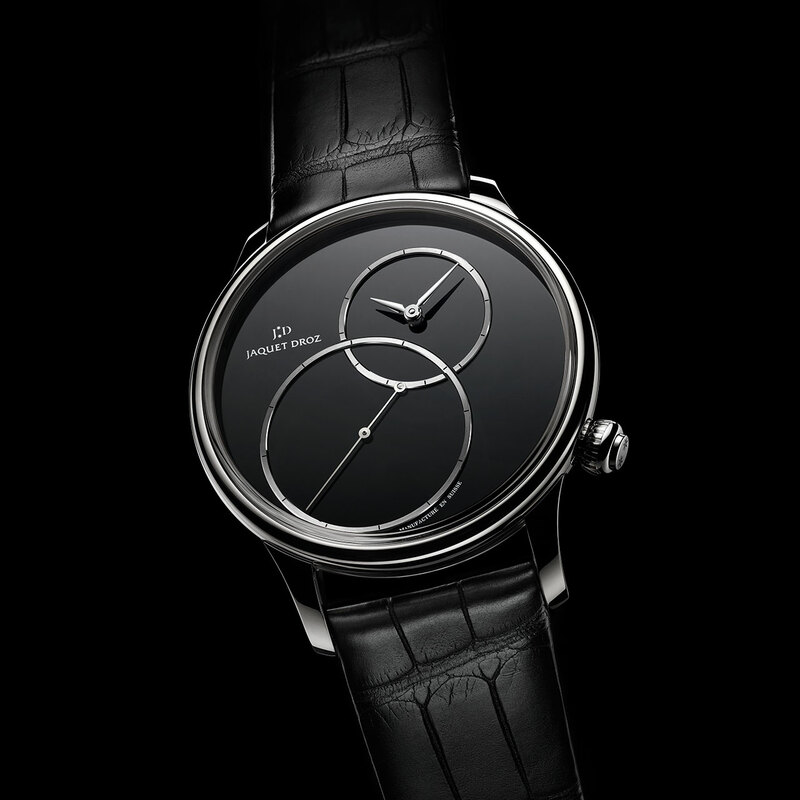 Imagined in the eighteenth century by Pierre Jaquet-Droz, the Grande Seconde has never ceased to reinvent itself, balancing a sense of history with modern elegance. 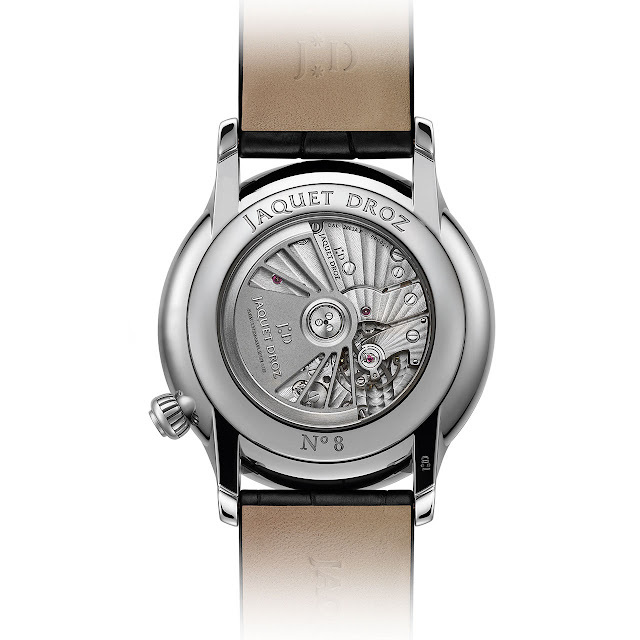 For this supremely sober interpretation, the craftsmen at Jaquet Droz have revisited the "figure 8" aesthetic by offsetting the seconds and, at the same time, enveloping the two interlocking rings in an air of mystery. Presented for the first time in a 43-mm steel case, the Grande Seconde Off-Centered amplifies the intensity of black with an onyx dial that has been painstakingly cut and polished, in the grand tradition of mineral dials by Jaquet Droz. Like darts of light across a liquid surface, it creates a voluptuous play of brilliance. Equally captivating is the extraordinary sense of aesthetic in this mechanical timepiece, whose point of equilibrium extends onto the case with the discreet winding crown, also off-centred. 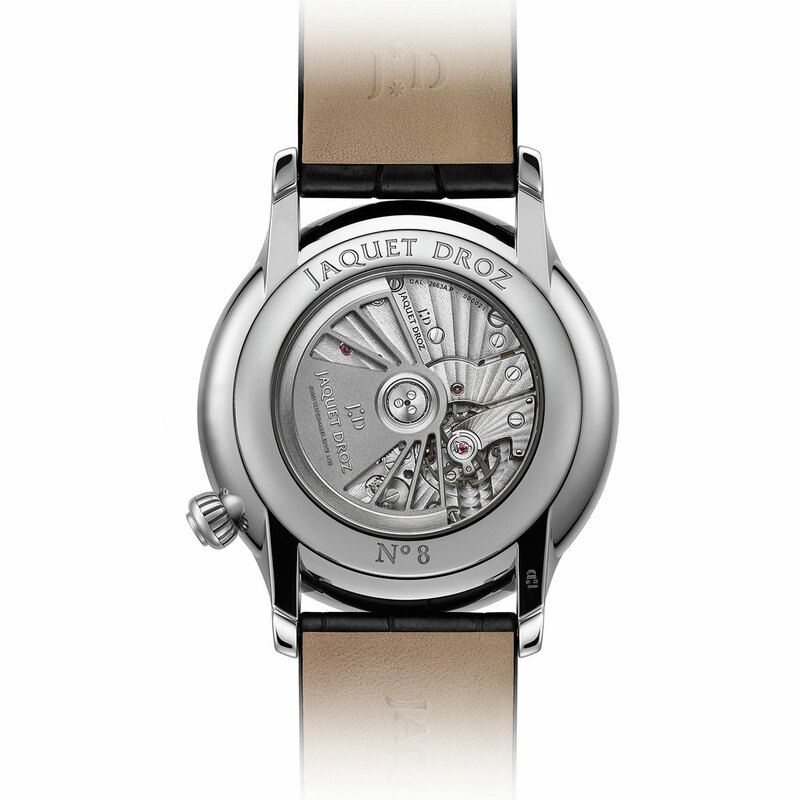 Mechanical automatic, Jaquet Droz 2663A.P calibre, 30 jewels, 28,800 vib/h, twin barrel, silicon balance spring, silicon horns on the pallet fork, 68-hour power reserve. Stainless steel, 43 mm. Winding crown at 4 o'clock. Sapphire crystals, front and back. Water-resistant to 3 bar (30 m/100 ft). Black onyx. Applied rings in 18K white gold. 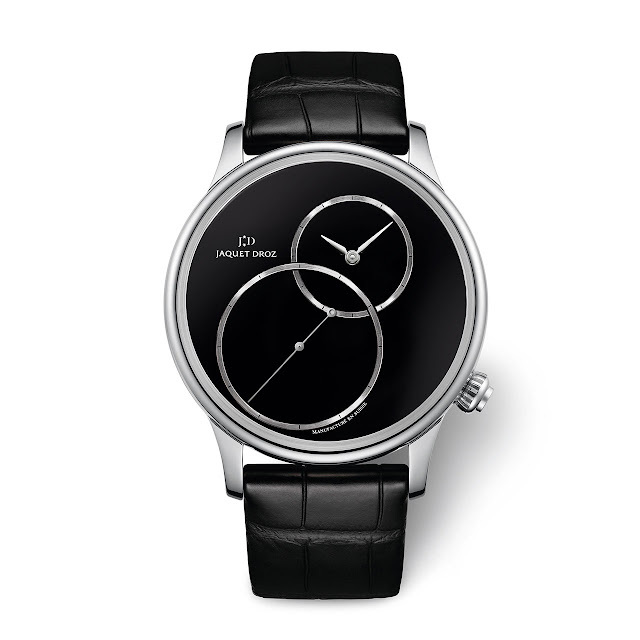 Off-centre hours and minutes at 1 o'clock, off-centre large seconds at 7 o'clock. Black alligator with hand-rolled edges, steel folding clasp.